Professor Feargal Cochrane is Professor of International Conflict Analysis in the School of Politics and International Relations and is Director of the Conflict Analysis Research Centre (CARC). He joined the University of Kent in September 2012. He was previously Director of the Richardson Institute, a peace and conflict studies research centre at Lancaster University (2005-2012). Before this he was a Lecturer (1998-2004) & Senior Lecturer (2004-2012) in the Department of Politics, Philosophy and Religion at Lancaster University. Professor Cochrane has also held academic posts at the Centre for the Study of Conflict, University of Ulster (1996-1998) and at Queen’s University Belfast (1994-1995). 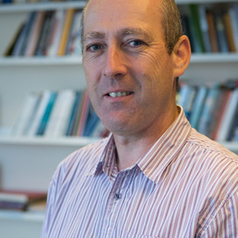 Professor Cochrane has published widely in the area of political violence and conflict transformation in leading international journals and with prestigious academic publishing houses and has presented his research at numerous conferences and through keynote addresses. Professor Cochrane is regularly consulted by the media on issues relating to peace and conflict including UK and international Radio and a range of print outlets including newspapers and magazines.